Former Special Forces combat medic Ron Shurer ’01, now serving as a member of the U.S. Secret Service, returned to his alma mater last November a national hero. 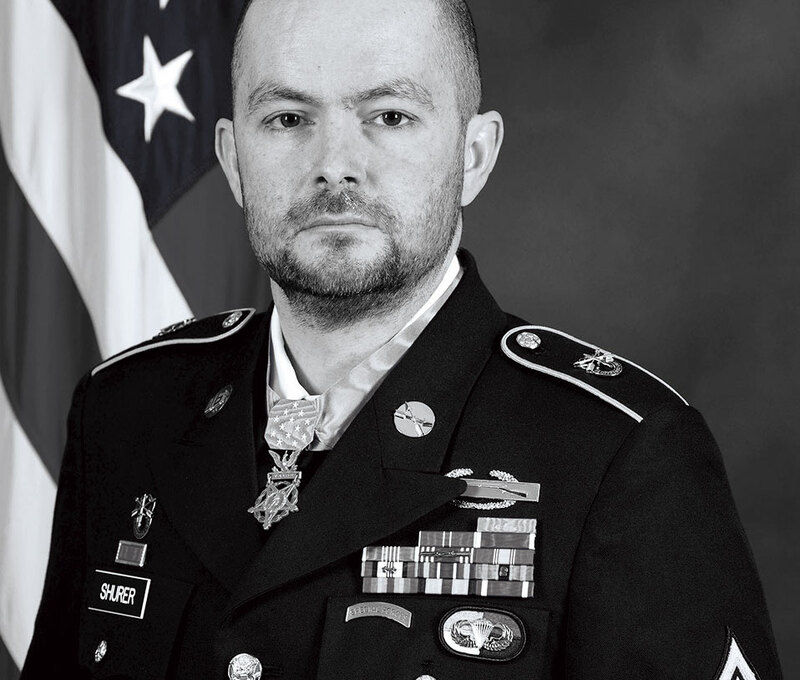 Shurer did two tours in Afghanistan with the U.S. Army, and his valor during the 2008 battle of Shok Valley earned him the Medal of Honor, bestowed last October during a White House ceremony where the gratitude of a nation was draped literally around his neck. Not a single U.S. soldier died in the six‑hour battle, despite multiple casualties, as Shurer scrambled through heavy enemy fire to treat and evacuate the wounded while helping hold the attackers at bay and being wounded himself. At the 2018 Apple Cup, he hoisted the Cougar flag and was recognized during the annual rivalry game. He also added another honor to his impressive list of accomplishments, the WSU Board of Regents Distinguished Alumnus Award. Shurer had joined the Army in 2003 and, two years later, he was accepted for Special Forces training and donned the elite green beret as a medic. In the Special Forces, medics are part of the offensive fighting capability of their units. Their medical training is considered a secondary skill similar to how others in the unit might have demolitions expertise or are trained in radio operations. Because of that, they receive no special protections that are supposed to be afforded medical personnel in war zones. Shurer left the Army a little over a year after the Shok Valley battle and was hired by the U.S. Secret Service, where he serves as part of the Counter Assault Team, which protects the president from possible attacks. He and his wife Miranda, along with their two sons, live in Virginia.